Wine tasting never ends on the year-round Mason-Dixon Wine Trail, so gather your friends and come visit us. Vineyards stretch from York County to Hershey, Gettysburg and Lancaster through Pennsylvania&apos;s Dutch County Roads and south to across the Mason-Dixon line to Baltimore, Maryland. Throughout the year wineries offer festivals, concerts and multiple events. Wallet-friendly packages are available to help make the perfect Sip & Stay Getaway. As one of our Good Libations Trails, you can find more information on the Mason-Dixon Wine Trail, as well as your Trail Passport in our Good Libations Trails Map & Guide. Request your copy today! The Mason-Dixon Wine Trail is organized and promoted by the York County Convention & Visitors Bureau (York County CVB) as a way for wine enthusiasts to explore the large number of family-owned wineries in York County and the surrounding area. For more information, call 1-888-858-YORK or email louise@yorkpa.org. 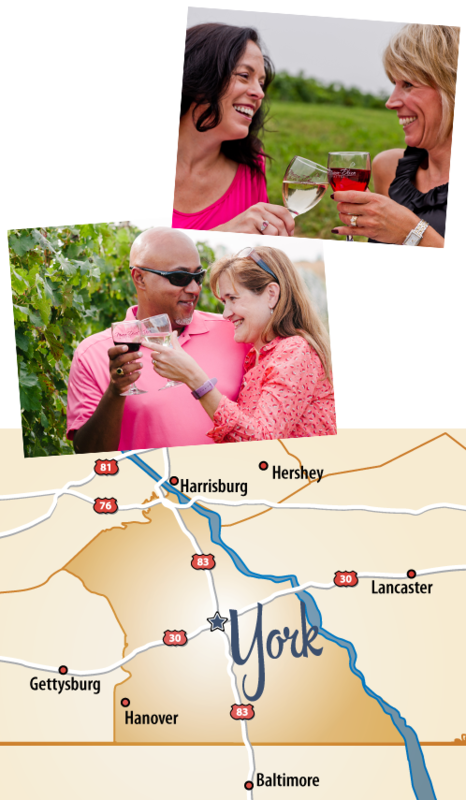 If you want to keep up with all the exciting things going on along the Mason-Dixon Wine Trail, sign up for our Explore York Getaway Guide, our monthly enewsletter for all things York County, and make sure to like our Explore York Facebook page to stay connected! Each winery has a unique experience and rich history and provides their own original touches that reflect the many varieties of wine offered. Not all wineries on the Mason-Dixon Wine Trail accept groups or buses during special trail events. You are encouraged to call the wineries to ask about their policies. Mason-Dixon Wine Trail members also host their own events throughout the year and are open at various hours to the public. Do not drink and drive; use a designated driver.